Over the past few years, the print version of Fast Company has been brought back from near-death (thanks largely to the efforts of top editors Bob Safian and Will Bourne, both of whom were editors of mine years ago at Fortune). Now it is trying to shake things up on the digital side. You might have heard that guy Scoble is starting FastCompany.TV. First off, here’s what it’s not: It’s not a pure social network. . . . You go to Facebook or MySpace and find the friends and co-workers you already know. The real world gets reproduced virtually. Maybe you meet a friend of a friend. We’re an entirely new community of people brought together because we want to share ideas about business. We like business. We think it’s important. Work gives more meaning to our lives. We believe business profoundly helps define our culture. 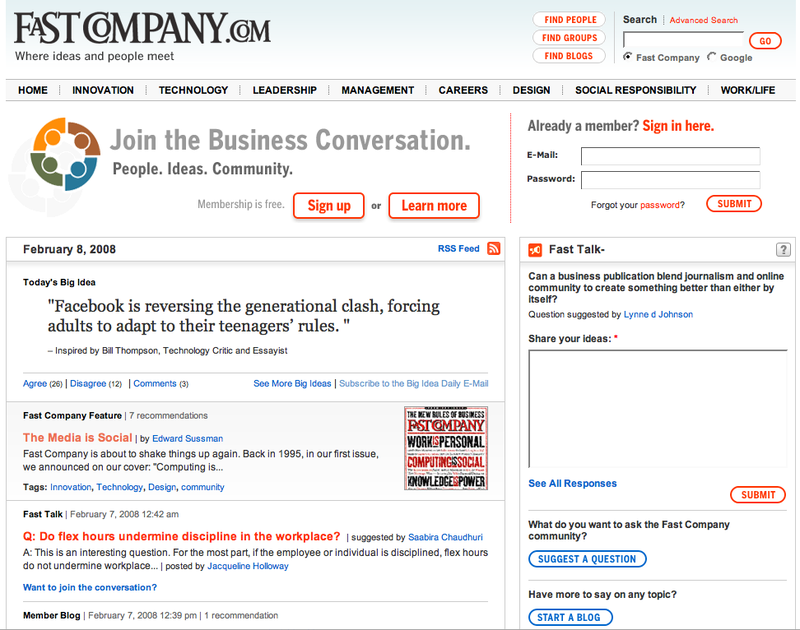 On FastCompany.com, you can now start your own blog, join a group, post a video, comment on articles, or suggest a “Fast Talk” question to start a debate. Articles from the print publication are interspersed with blog posts from readers, experts, and staffers, and are arranged in a blog-like chronology on the front page. During the dying days of Business 2.0, I remember sitting in editor Josh Quittner’s office brainstorming about how we could do pretty much the exact same thing to save that magazine. We never got beyond the brainstorming. 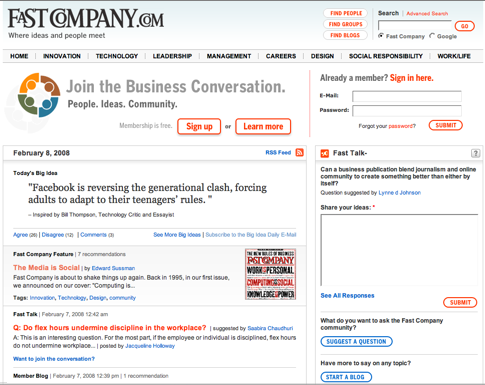 Whether or not this will work for Fast Company depends on how smart its readers are and how willing they are to contribute. But any media site that does not listen to its readers and, indeed, allow them to take over the conversation at times, is doomed for the dustbin. We saw this with the recent relaunch of the Industry Standard, which tries to engage readers to predict future business events. And we will continue to see it moving forward. As a result, mainstream media and the blogosphere will become harder and harder to tell apart. It will just all become part of the bigger conversation.